Unearth hidden insights with a personalized analytics experience driven by AI – on any budget. 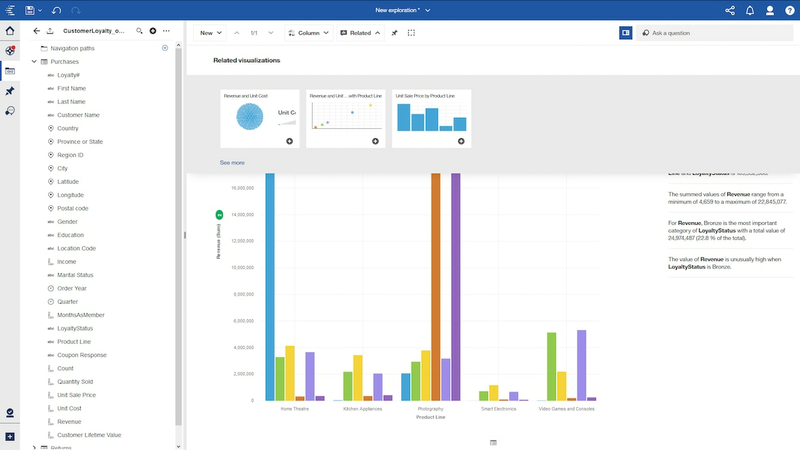 For the data explorer obsessed with knowing their data better than anyone, finding answers no one else can find, and delivering the most compelling data stories, Cognos Analytics delivers a personal analytics experience designed to make you the data guru on any team. With automated data preparation and natural language generation, you'll be an expert in no time, using AI assistance to gather data, deliver hidden insights, and produce stunning and accurate visualizations. Technologies like Natural Language Understanding and Natural Language Generation will help you harness all available data and assets in the system and provide deeper insights. Explore relationships and patterns in your data you didn't even know existed. Receive more profound insights in language you can understand. Unearth hard-to-find answers and relationships and present those findings in succinct, natural language statements. Benefit from a graduated, intuitive experience that reveals capabilities as you need them. Save time with automated data preparation. Get intelligent responses to your questions in everyday language.